You are currently browsing the Gluten Free For Good blog archives for March, 2011. I’m a product of the sixties, a hippie-girl at heart. This whole chard-eating, brown rice-making, kefir-drinking way of life is nothing new to me. 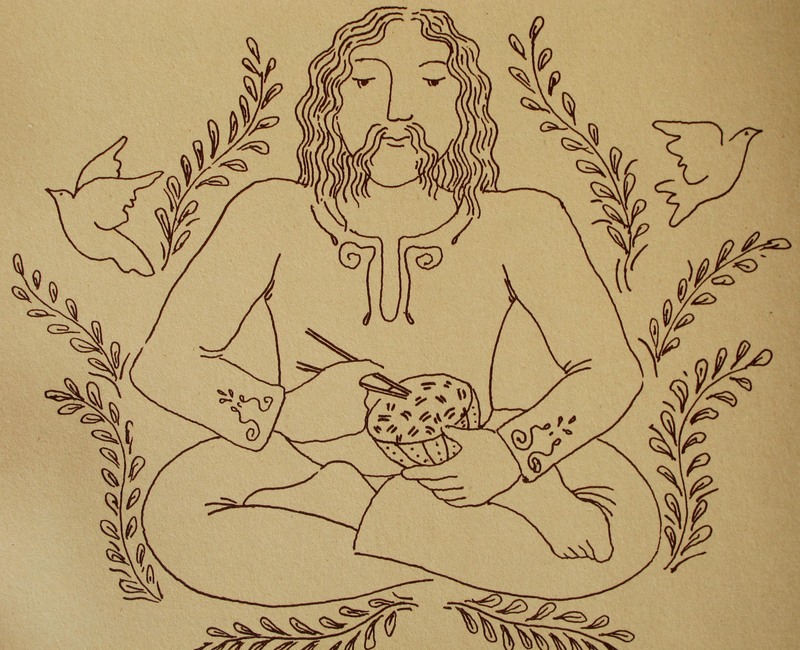 In fact, the first two cookbooks I bought when I launched out on my own were the Vegetarian Epicure (circa 1972, cover pictured above) and the Tassajara Vegetarian Cookbook from the San Francisco Zen Center (circa 1973). No Joy of Cooking or Julie & Julia stuff for me. I wanted cookbooks that focused on beets, burdock root and buckwheat groats. I made my own bread, wandered the wilderness, belonged to a food co-op, wore flowers in my hair and advocated peace, love and tie-dyes. I also voted for Nixon, but that’s another story. 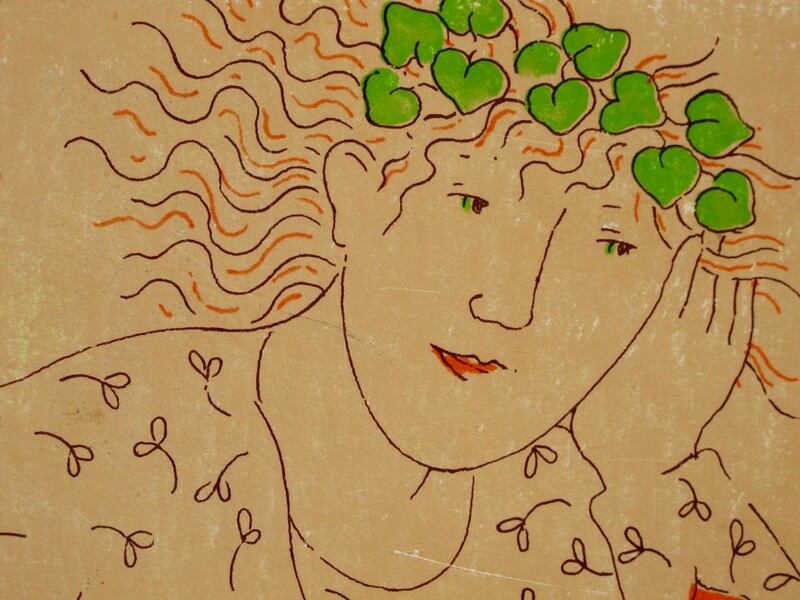 Anna Thomas, a 60s soul sister, wrote the Vegetarian Epicure while she was in college. Considered the whole foods bible of the vegetarian fringe in the 1970s, it’s now a classic and still in print. I treasure my original, well-worn, food-stained copy. I don’t know which parts of the book I like more. The recipes, the earth-brown pages, the marijuana references, or the far-out hippie drawings scattered through-out the book. 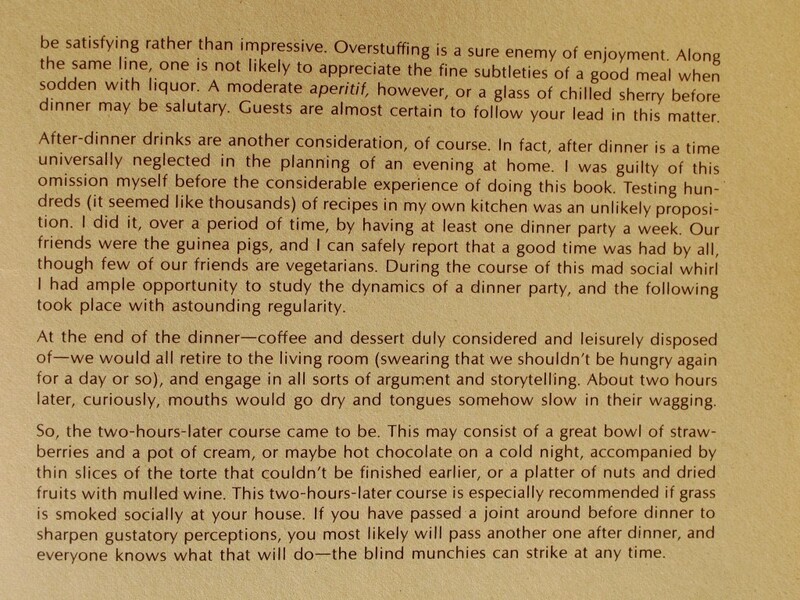 Read the last paragraph from the “Entertainment” section of my tattered cookbook. Actually, read the whole page. It’s absolutely wonderful and she’s so right-on when it comes to food, friends and entertaining. Anna’s new book, Love Soup, has quickly become one of my current favorites. Just so you know, I’m not a pot-smoking nutritionist, but I do have fond memories of my first introductions to ghee (clarified butter), curry and veggie rice bowls. I can thank Anna Thomas for that. And yes, I probably dated this guy. Buddha Bowls consist of brown rice or another grain (quinoa works well), sautéed veggies and some kind of sauce. They’re meant to be a launching pad for whatever your heart (and stomach) desires. Options include adding meat or tofu, although mine are usually veggie bowls. Sit in lotus position, oomm in gratitude, and eat all your food out of one bowl. • Elana from Elana’s pantry posted a Mexican chicken and “rice” recipe a couple of years ago with a quirky grain-free twist to the Buddha bowl. • Ali of Whole Life Nutrition has a recipe for Summer Vegetable Kitcheree that is akin to a Buddha Bowl and is as tasty as it is healthy. • Fellow nutritionist, Cheryl Harris of Gluten Free Goodness, has a great recipe for a basic quinoa bowl laced with mint and lemon. You might have to save this one for mint season, but it’s a nice addition to the Buddha bowl list. Peace, love, Buddha bowls and hippie chicks! • I took the above photos of the cover and two pages from my 1972 vintage book, The Vegetarian Epicure. I hope I don’t get in trouble. I think the highly intelligent plant world is trying to tell us something with this chunk of cauliflower. Doesn’t it look like a mid-sagittal section right out of a frontal lobe, complete with cerebral white matter? Or, maybe networks of giant axons and dendrites. 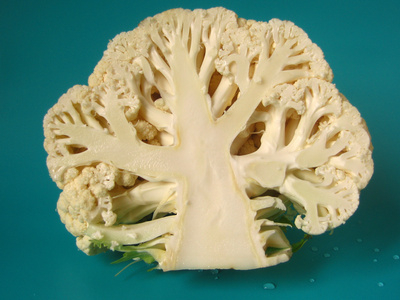 This head (whoa, it’s even called a head) of cauliflower appears to be a bit left-brain-heavy. What do you think? More neural pathways on the left side? Aaah, must be a linear thinker. I’ll put aside my vivid imagination and interest in plant autopsies for a moment and talk about the healing power of whole foods. Most of us have enough bizarro stuff going on inside our heads that can sabotage our good intentions, let’s at least give our thoughts some powerful building blocks and mighty antioxidants to work with. I can’t start this “brain food” list without commenting on gluten as a neuro-cootie. This is official – research has shown gluten to be a neuro-toxin (for some susceptible people). It can cause ataxia, epilepsy-like symptoms, peripheral neuropathy, depression, migraines, brain fog and a host of other neurological problems. In some rare instances, the neurological impact of gluten can even mimic ALS (Lou Gehrig’s Disease), MS and Parkinson’s Disease. Get tested for celiac disease if you have unusual neurological symptoms. A gluten-free, whole foods diet may (will) be beneficial. Check here for Dr. Rodney Ford’s take on this years ago. Scientific research is finally catching up to his diagnostic skills as a physician. • EFAs (essential fatty acids) are important for brain function. Wild-caught salmon and other cold-water fish, flax seeds, nuts, and pastured eggs are examples of foods rich in EFAs. • Proper hydration is important for brain function. Dehydration causes the release of stress hormones, which impact neurons. • Organic, whole foods rich in antioxidants should be the focus of a “healthy brain” diet. Antioxidants help prevent and repair cell damage. • Sunshine stimulates the production of vitamin D, which is thought to aid in the protection of neurons. Plus, a little sunshine can boost your mood. This list is just a random assortment of nutrient-dense foods that I like and are high in antioxidant power. I’ve chosen foods that are easy to find and that people might actually eat. No need to scour the Amazon rainforest floor for some exotic plant or climb the Himalayas for a power-packed berry. Seriously, let’s make this easy. Organic is always best and I prefer eating the whole food rather than counting on supplements. That way you get a diverse combination of beneficial phytonutrients. Cauliflower is packed with vitamin C, a powerful antioxidant. Research is mounting that oxidative damage to brain cells may precede diseases like Alzheimer’s and other forms of dementia. One cup of raw cauliflower contains 94% of the daily value for vitamin C. It’s also anti-inflammatory and is a good source of protein, calcium, iron, magnesium, zinc and other plant goodies. Please check out this past post I did on EFAs and why they are important for brain health. The post also includes a detailed break-down of omega-3s and omega-6s and a wonderful salmon recipe. Lots of good brain-building information in that post. 3. Blackberries, blueberries, cranberries, raspberries, strawberries, cherries. All of these fruits are packed with antioxidants. Don’t stick with one choice – mix and match them for a variety of protective compounds. You’re probably thinking this is an unlikely choice for the top 8 brain foods, but I’ve decided it’s a good representative for leafy greens in general (kale, collard greens, spinach, chard). One cup of mustard greens, which I’ve recently become quite fond of, has 118% of the daily value of vitamin A and 65% of the daily value of vitamin C. It’s also a good source of vitamin E and it’s anti-inflammatory. A, C and E are all antioxidants, so this green is a good one to make friends with. I throw it in smoothies. Surprise, surprise! As those of you following this blog know, even though I’m a nutritionist, I don’t think coffee is evil. In fact, I like the stuff in small doses and guess what? It’s not only high in antioxidants, research indicates the caffeine in coffee has a neuroprotective effect. Choose organic coffee, use in moderation (1-2 cups per day) and don’t drink it later in the day. Beans are a good source of easily-absorbed amino acids, which are important in the production of enzymes and neurotransmitters. Eggs are one of the best sources of high-quality protein. Pastured eggs are also high in omega-3s, vitamin A, vitamin E and B vitamins, all of which are important for healthy brain function. Good, high-quality dark chocolate in moderation is a good source of antioxidants. Plus, a chunk of dark chocolate now and then puts you in a good mood and makes you a nicer person. I’m nicer when people give me chocolate. Aren’t you? Peace, love and brain power!